Why choose the JVIGUE Silicone Pastry Bags? Non-slip design, very durable and easy to clean ! Cake Icing bags ties prevent cream from overflow when frosting. 3 Different sizes cake icing bags for different requirements :Ideal for making cakes, biscuit, cookies, chocolate, pie, etc. You can decorate baked goods with your friends or family. Don't put in boiling water or fire. What are you waiting for?? When you click in the ADD TO CART button at the top right of this page you'll get the best Pastry Bag you'll EVER OWN! 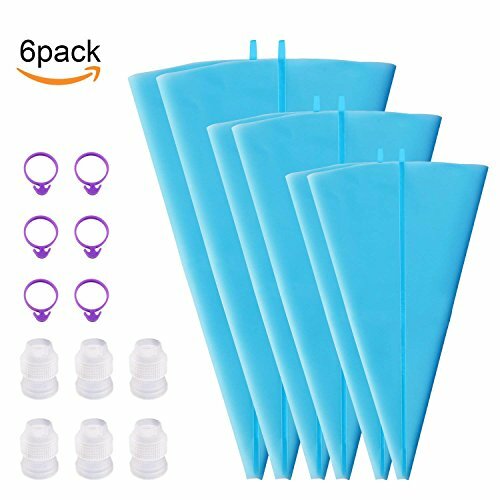 Worthy Buying silicone Pastry Bags: Include 6 reusable silicone pastry bags and 6 Standard Couplers 6 Icing Bag Ties, perfect for cake, cupcake, cookie, biscuit, macaron and pie decoration. Safe Material: Food grade silicone Pastry bags and PP plastic couplers, FDA and FLGB approved, BPA free; Odorless, Non-toxic, Durable, Flexible and a little Stretchy, Plus, these small, medium and large piping bags have convenient loops for hanging. Reusable and Eco-friendly: Silicone piping bags are easy to clean, reusable and environmentally friendly and will not harm the environment.You can easily decorate your cakes, pies, donuts and cookies with your kids and friends at home. Reusable Bag Ties and Useful Couplers: 6 Couplers and 6 reusable ties,easily and quickly change tips, 6 reusable ties can very good to avoid cream leakage when frosting or stop pastry work. Free Lifetime Guarantee: We are confident to the quality of our silicone bags set. We will give you full refund with no question asked if you have any unhappy purchase experience, but we are sure to say that you will love it! If you have any questions about this product by Jeicy, contact us by completing and submitting the form below. If you are looking for a specif part number, please include it with your message.